A zebra at rest with no threat of predators, for instance, will be operating within the “rest and digest” functions of the parasympathetic nervous system. When chased by a lion, drastic physiological changes with the activation of the fight-or-flight response of the sympathetic nervous system : heart rate increases, breathing increases, large amounts of stress hormones like cortisol and adrenaline are released into the bloodstream, pupils dilate, blood pressure increases and any non-essential functions like digestion stop. The zebra’s nervous system prepares it to run for its life. If the zebra is caught, the nervous system is overwhelmed, and has no further solutions - this is the freeze response. This point is what we consider trauma. Zebra that survives the encounter literally “shakes it off” and returns to a resting state. Hyperarousal fight or flight @mattstratton Hyperaroused organizations will display effects of “constant vigilance” and be hyper-aware of threats which take energy away from moving forward. They are “stuck on on”. Often times this is reflected in how leadership approaches outages and issues. Wartime metaphors, etc. Production support teams. Inappropriate response @mattstratton The signal may seem similar, but it’s not exactly the same. We look for pattern recognition, because the signals seem the same as previous examples, but the complexity makes this inappropriate. Consider removing shoes at the TSA. December 22, 2001.Richard Reid tries to ignite explosives hidden in his shoes on a flight from Paris to Miami. As a result, TSA begins randomly searching people’s shoes. In 2006, the TSA mandates that all passengers must remove their shoes going through security. @mattstratton We need to learn to stop jumping on the first root cause. And look - more zebras. Identify your organization’s window of tolerance @mattstratton What can we do to understand our window of tolerance as an org? How can we identify when we are deregulated? Regulate @mattstratton No, this is not a Warren G reference. How do humans and organizations take a deregulated state and become regulated? One of the treatments for post-traumatic stress is Eye Movement Desensitization and Reprocessing (EMDR), in which the patient’s diﬃcult memories are offset with a positive association that is reinforced through external stimuli. Organizational EMDR @mattstratton Obviously, we can’t do the exact same thing. But what are some things that we can do, to help achieve the same result? Game days @mattstratton We want to make an association with outages and issues with a safe place. Game days can help do this, but they have to be done properly. Keep them low stress and safe - the point isn’t to practice under pressure, but to associate response with a safe environment. When exploring in a game day, you need to have guidance. It’s like meditation. With some kinds of trauma, meditation is helpful. But the problem is when people go into their inner landscape and they're not prepared and they're not guided, sooner or later they encounter the trauma, and then what do they do? They could be overwhelmed with it, or they find a way to go away from the trauma. Similarly, if we don’t have plans in place for our game day, we are going to get wound around the axle. Also, in meditation for trauma, we can get what Levine calls “bliss bypass”. It's a way of avoiding the trauma - so if our game isn’t following our usual rules, we made it “too” safe. Planned failure injection @mattstratton If you do planned failure injection in a gameday, run them like a real incident. Failure Fridays at Pagerduty for example. We follow full Incident Command processes. This causes an organizational association of a safe place for incidents. This is also why you run all incidents at the initial severity. Even if you start them and realize they weren’t an incident, or a sev 1, or whatever, run them to their full course. Process failure @mattstratton Blameless is just the beginning here. We need to process the failure/outage through all the information that we have, and the processing needs to have a conclusion. Otherwise it is unprocessed trauma. There is a misconception that to process trauma is to “get it all out”. We need to integrate our experiences into a coherent whole. This includes telling our stories as well as changing our autonomic nervous systems, which in the case of an organization has to do with how we respond to outages and incidents. A word about somatic experiencing @mattstratton In top down therapy, it starts with the emotions. Why do you feel the way you do. This is very similar to looking for a root cause first. In somatic experiencing, the body is worked with first, to enable a titrated approach to the emotions. Similarly, during an incident you are working to restore service prior to determining cause. And it’s important to look at the whole system when processing it, not starting with the surface “emotions” which are the symptoms of the outage. “Resilient strength is the opposite of helplessness.” –Dr. Peter Levine @mattstratton As Hannah mentioned yesterday in her talk, being resilient means that we don’t see things from the perspective of things that happen TO us. It is a matter of what can we do going forward. A culture of blame creates a culture of helplessness. Cognitive distortions @mattstratton Cognitive distortions are exactly what the name implies: distortions in our cognition. They are perspectives with bias. They are irrational thoughts and beliefs that we unknowingly reinforce over time. These patterns and systems of thought are often subtle – it’s diﬃcult to recognize them when they are a regular feature of your day-to-day thoughts. There are as many as 16 generally accepted cognitive distortions; we’re only going to touch on a few that might be causing issues for you in your organization. Polarized thinking @mattstratton Also known as “all or nothing” thinking. This is seeing everything in extremes. It’s either perfection or total failure. Remember that our systems are always in some state of failure; we don’t have perfection. Control fallacies @mattstratton A control fallacy manifests as one of two beliefs: (1) that we have no control over our lives and are helpless victims of fate, or (2) that we are in complete control of ourselves and our surroundings, giving us responsibility for the feelings of those around us. Both beliefs are damaging, and both are equally inaccurate. No one is in complete control of what happens to them, and no one has absolutely no control over their situation. Even in extreme situations where an individual seemingly has no choices in what they do, where they go, or what they say, they still have a certain amount of control over how they approach their situation mentally. mattstratton.com/speaking @mattstratton This deck, as well as supporting links and resources, will be available at this URL. Thank you! 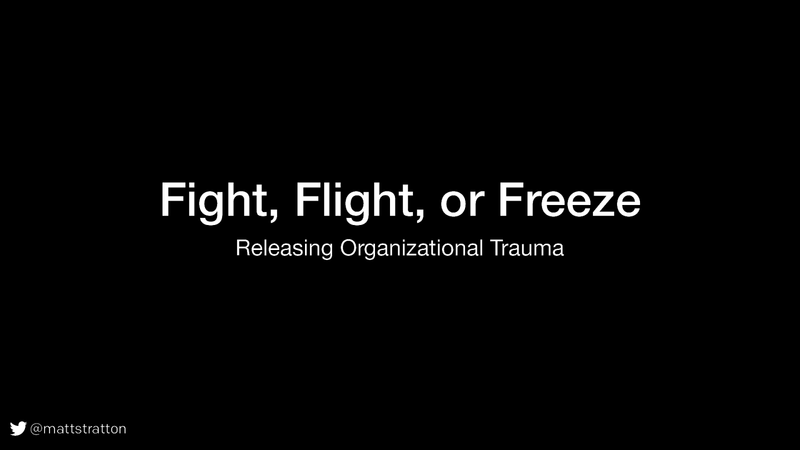 View Fight, Flight, or Freeze — Releasing Organizational Trauma. Q: How can we safely affect an org that’s all on or all off? #devopsdays #devopsdaysnyc @mattstratton: How can we make our postmortem a narrative? One that gets told over and over again. "What can we do to understand your organization's window of tolerance?